Dorinda G. Dallmeyer is director of the Environmental Ethics Certificate Program at the University of Georgia. A native of Macon, Georgia, she holds three degrees from UGA: B.S. and M.S. degrees in geology and a J.D. Ms. Dallmeyer is a member of the Council on Foreign Relations and past vice-president of the American Society of International Law. At UGA, she teaches courses in environmental dispute resolution and marine environmental ethics. 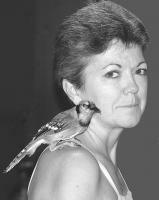 Since 2001 she has collaborated with a group of southern nature writers in creating the Southern Nature Project, founded on the conviction that writing can help us lead more human, profound, and courageous lives, thereby conserving the southern environment for generations yet to come. The Project has staged writers workshops and conferences as well as live readings broadcast on public radio. In 2005 the Southern Environmental Law Center presented her with two Phillip Reed Memorial Awards for Outstanding Writing about the Southern Environment: one she shared with the University of Georgia Press for her edited anthology Elemental South and the second for an advocacy essay entitled Waiting for a Train. A devoted naturalist, in her spare time Dorinda and her husband David lecture on expedition cruises that have taken them to the Arctic, Central and South America, along with more than 20 expeditions to Antarctica. They live on 50 acres in rural Madison County, Georgia. This time, I will not have the voice of the wood thrush. This time, I will not know what the squirrel sees as she hurdles limbs high in the white oaks. This time, I will not feel the signal down my side that sends the school of mullet arcing from sea to sky. But this time, I can write. And so I turn my skills to work on their behalf, this time, in this life ? the only one I will ever know.